Mr George W. Bush today wooed India like no other US President had ever done before and admitted that he had been “dazzled” by India. Like a seasoned Indophile, he reeled out facts after facts, with a liberal sprinkling of quotable quotes from two great makers of India — Mahatma Gandhi and Pandit Jawaharlal Nehru — to convey to his countrymen back home that India had arrived. Has India gained by President Bush’s visit? 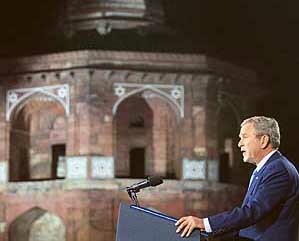 US President George W. Bush delivers a speech at Purana Qila in New Delhi on Friday. Prime Minister Manmohan Singh will make a statement and give details of the Indo-US nuclear deal in Parliament on March 6. Mr Pranab Mukherjee said the visit of US President George W. Bush was not yet over and the Prime Minister would make a statement on the issue next week. 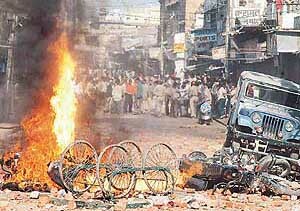 Anti-Bush protests flared up into communal violence leaving at least four dead and 13 seriously injured. Property, shops and vehicles were damaged during arson in major shopping areas laying hollow the administration’s claim of preparedness to tackle the protesters. Violence started after the Friday prayers when anti-Bush protesters got into an argument with shopkeepers in Maulviganj over downing of shutters. Let me tell you, we want your money. Those who have money have the technology also. I want your technology also. I want your good management policies, good governance norms. Reiterating its interim findings to the extreme annoyance of the BJP, the Justice U.C. Banerjee committee today said that the February 2002 fire in the S-6 coach of Sabarmati Express was “accidental and not deliberate”. It was a day of mixed feelings for the former Chief Minister and INLD supremo, Mr Om Prakash Chautala. While he was gloating over the relatively successfully Panipat rally, organised by his party to protest against the removal of the name of his father Devi Lal, from that of Panipat Thermal Plant, news came that the Centre had allowed the CBI to take up inquiry against him and his family members for allegedly amassing assets disproportionate to their income when his party was in power.